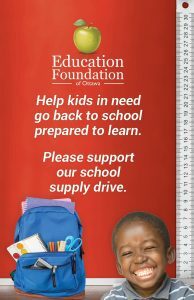 More than 1,200 students go to school in September without a backpack or schools supplies. Some families have to choose between paying rent, feeding their kids, or buying a backpack with supplies. Average costs of packs and supplies run between $25 and $50. Our Tools for Learning program helps ensure these students and their families are provided with a backpack full of supplies to start the school year. Please click the DONATE button to make a gift and fill a backpack.